As I write, we are traveling south from the Galilee along the Jordan River toward the West Bank. We are scheduled to visit Shorashim, a program run by Rabbi Hanan Schlesinger and Ali Abu Awad that brings Palestinians and their Israeli neighbors together despite the walls of fear that separate them. We are still not certain if we will be able to go because the checkpoint into the West Bank has been closed for two days since an attack that happened there. And so we are experiencing a very real reminder of the barriers to peace in the every day lives of people who reside in this region. 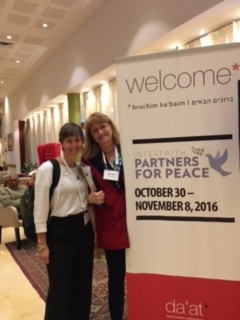 On the other hand, our touring this morning presented a powerful lesson of how one small group of people can be agents for peace. Visiting Christian holy sites with my mission friends on this trip has given me a new understanding of how deeply cherished this land is by all three major religions. 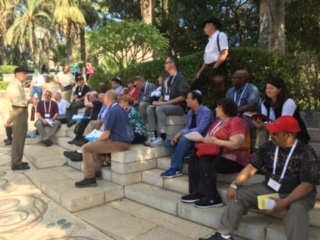 At Mount of the Beatitudes (where Christian tradition teaches that Jesus delivered the Sermon on the Mount), I entered the church with my clergy partner, Rev. Barbara Hoffman. Experiencing the peace and positive energy beside Barbara was a transformative moment for me. 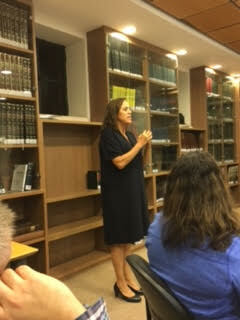 I think of Israel as the place where I am the guide, but in that moment, Barbara was teaching me. And so the seeds of peace are sown. At Kfar Nahum (Caperneum) we learned about the beginnings of Jesus’s ministry in the Galilee and observed groups of pilgrims gather to sing psalms and hymns. I was moved by the piety I witnessed. 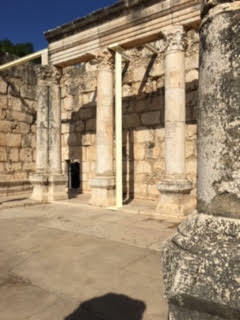 We also saw ruins that have long been assumed to have been a synagogue from the first century CE, but new archeological evidence puts those assumptions into doubt. Perhaps it was just a secular structure. Or perhaps it was built long after the first century to show what a synagogue would have looked like. Our guide pointed out that any historical or academic dispute can serve as a model for the work of our mission: to engage in honest dialogue and to learn from one another, we must be humble. When we think that something is true, we must be able to say: this is my truth, but maybe it’s not exactly as I thought it to be. There is room for me to be wrong and for you to be right. One of those important moments of debate happened over lunch at Café Café (yes, that actually is the name of the café!). Perhaps more important than the sites that we see are the conversations in which we engage. Over toasted haloumi cheese sandwiches and cafe hafuch, I listened to the life stories of a Presbyterian minister who worked as an insurance agent until he was called to serve as a minister, a Reform rabbi from Milwaukee and Barbara Hoffman, the Methodist minister in New City (and my clergy partner). What a blessing to come to know others! Our paths were so different but our passion to serve was the same. Knowing others helps us define ourselves. 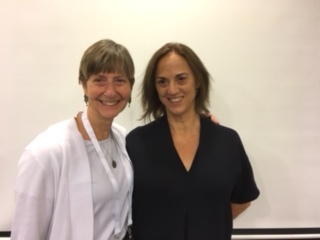 Over dinner tonight we learned about the weaving together of secular and religious Israeli cultures in a talk by one of my heroes, Ruth Calderon. Before dinner began, we learned about the arson today at a Mississippi black church. There are not adequate words to describe the power and compassion of holding a moment of silence in a room filled with rabbis and ministers, several of whom are people of color. One final note: we were not able to go into the West Bank today after all, but tomorrow we are going to Rawabi and Ramallah to meet with key Palestinian personalities, accompanied by journalist Gal Berger. We have directions to bring our passports for the checkpoint and to refrain from wearing kipot or Jewish/Israeli identifiers of any kind. It seems that learning in order to seek peace can sometimes be a nerve-wracking affair.